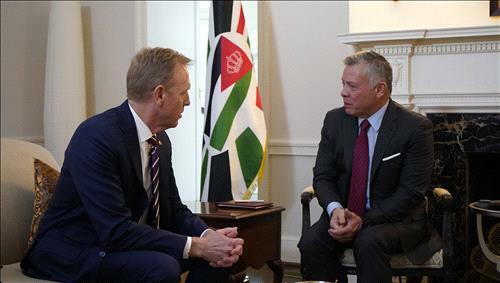 AMMONNEWS - His Majesty King Abdullah on Monday met with US Acting Secretary of Defence Patrick Shanahan to discuss military and defence cooperation between Jordan and the United States. The meeting covered the latest developments in the Middle East, efforts to reach political solutions to regional crises, and efforts to fight terrorism within a holistic approach and Jordanian-US cooperation in this regard. For his part, Acting US Secretary of Defence Shanahan expressed the United States’ appreciation for King Abdullah’s leadership and his efforts to ensure security and stability in the region, commending the level of partnership between the two countries. Foreign Minister Ayman Safadi and Jordan’s Ambassador in Washington, DC, Dina Kawar attended the meeting.